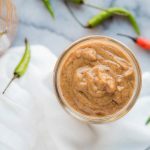 This is essentially the best spicy peanut sauce you’ve ever had, but made with almond butter instead of peanut butter. 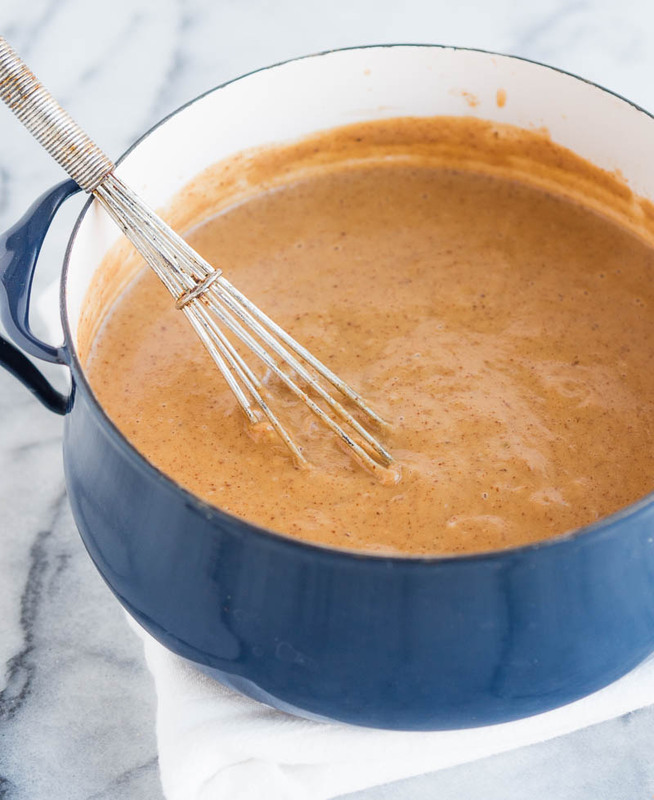 To be totally clear: I also make this with peanut butter. And I plan to make it with cashew butter. I think the possibilities might be endless here (this ring a bell for anyone? ha!). Full disclosure, this recipe is based off of a recipe my friend/coworker David shared with me — he got it offline somewhere way long ago, I think, and so I have no clue who to actually give any credit to. That said, I did make a fair number of adjustments. I know I’ve been MIA and promising life updates soon — because there is much to update about — but again: you’re just gonna have to wait. Between buying a home while selling a home, working two jobs, regaining my active lifestyle, managing a social life, and more: I’ve been a bit occupied. I’ll be back with a vengeance after we move, though! Then my Fridays will be filled with cooking and blogging and NOT with errands and paper-signing. Woohoo! 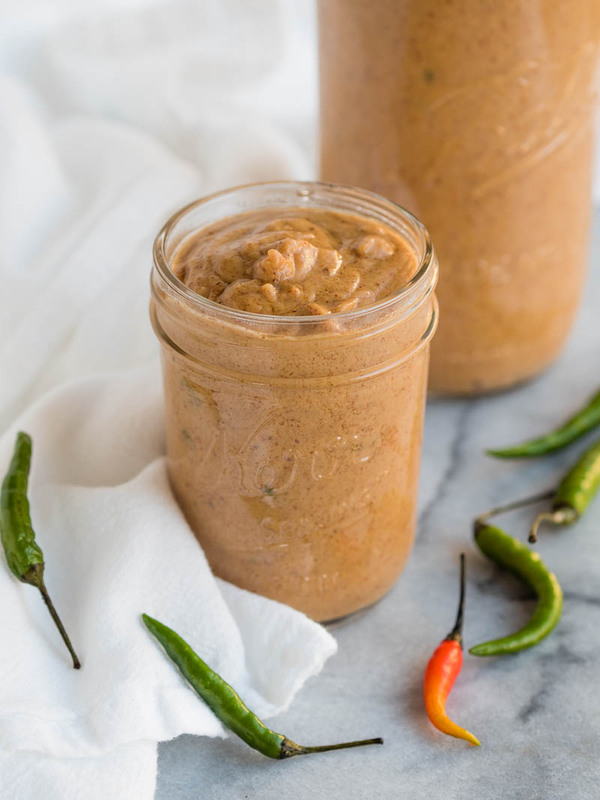 This spicy almond sauce recipe is an almond version of the best peanut sauce you’ve ever had. 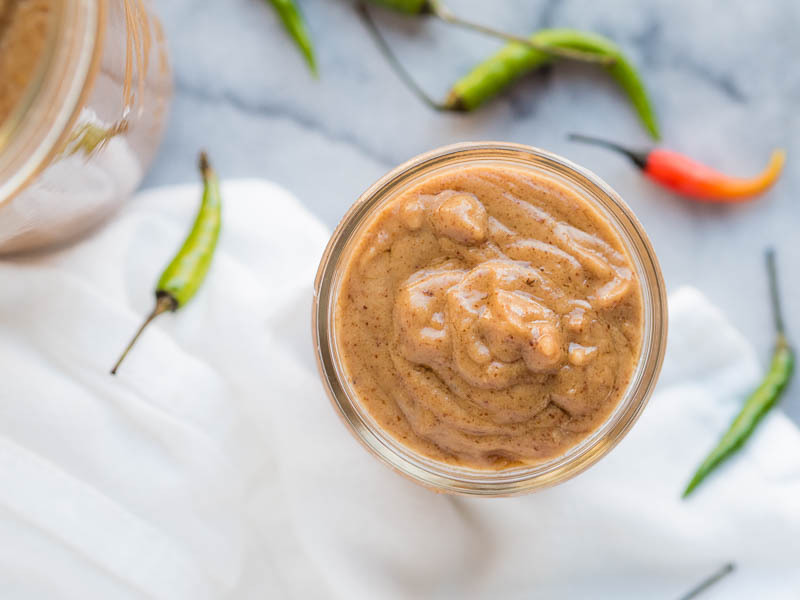 It’s quick to cook, can be as spicy as you want, and goes well on almond any food. Prepare and measure all of your ingredients before beginning. In a medium-sized saucepan over medium heat, add the sesame oil, garlic, ginger, and chiles. Cook, stirring frequently, until the chiles begin to soften (3 minute). Add the almond butter and soy sauce and stir (or whisk) until smooth. Add the fish sauce, mix to combine. Add the coconut milk, lime juice, honey, and chili garlic sauce and again whisk until completely smooth. Continue to whisk, making sure to not let the bottom burn, and bring the mixture to a simmer. Let simmer for five minutes before removing from the heat. Serve immediately, or let cool and store in an airtight container in the refrigerator. *For the chiles: I leave seeds in and go for some spice — you can leave seeds out, or opt for a less-spicy chile! Hi Mary! I’m excited to make this tonight 🙂 how long would you say it keeps for? Although it will probs be gone in a snap!